SMASH™, a special polyester filament nonwoven fabric, has the advantage of its thermo-plasticity and its shape can be easily changed when heated. It is a nonwoven highly functional fabric, which can be moulded using a hot press process. The material does not tear easily and has superior permeability as well as excellent print quality thanks to its smooth surface. 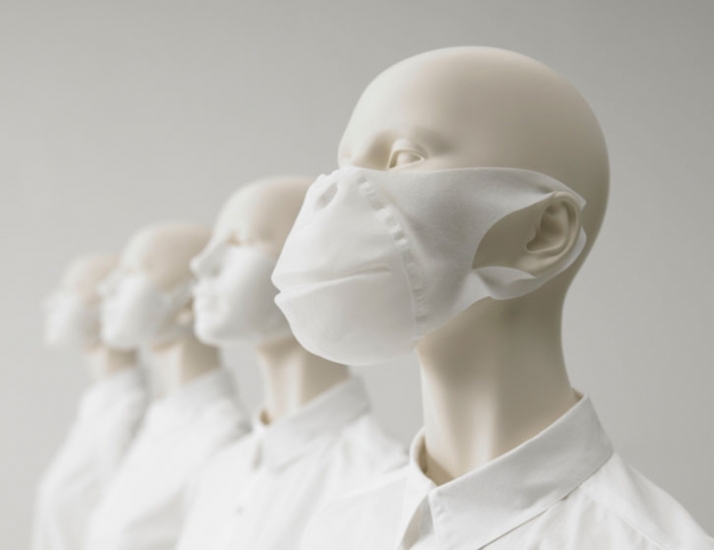 Mintdesigners were certainly in a good mood when they decided to create white masks for anybody who wants to be somebody. 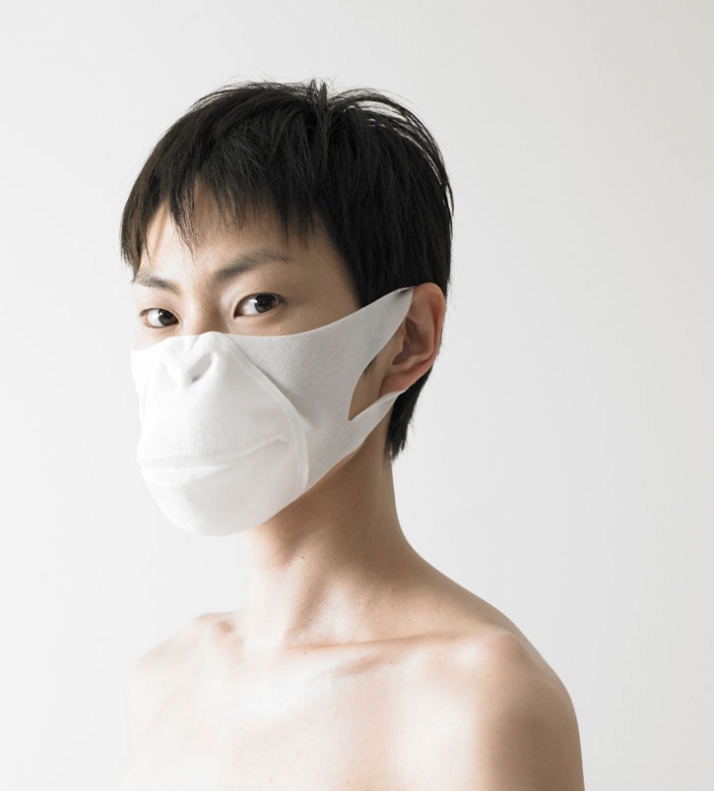 In Japan it is part of the daily life to see people in the streets wearing masks in order to protect themselves from germs or cold. The demand is so big that designers couldn't ignore this phenomenon. 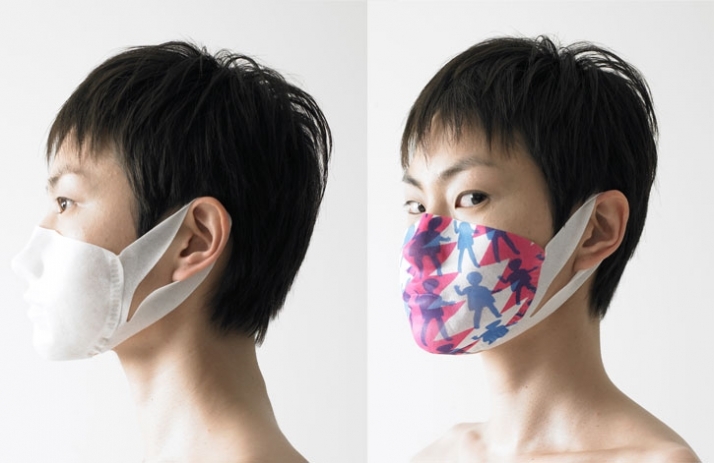 Mintdesigners decided to create a mask that can cheer someone up but with a touch of fashion and humour. Using a special polyester filament nonwoven fabric, called SMASH, provided by Asahi Kasei Fibers Corporation, they managed to create 3D designs such as a shape of a chimpanzee's face. Smash is a nonwoven highly functional fabric which can be molded using hot press process. The material does not tear easily and has superior permeability as well as excellent print quality thanks to its smooth surface. TERRAMAC®, which is made from poly-lactic acid primary material of which is plants, is a biodegradable fiber that returns to the soil. TERRAMAC® ’s conformational material integrates with nature and is environmentally friendly. The carbon material it contains within has been captured from the air by plants through the process of photosynthesis, and does not increase CO2 in the atmosphere even when incinerated. 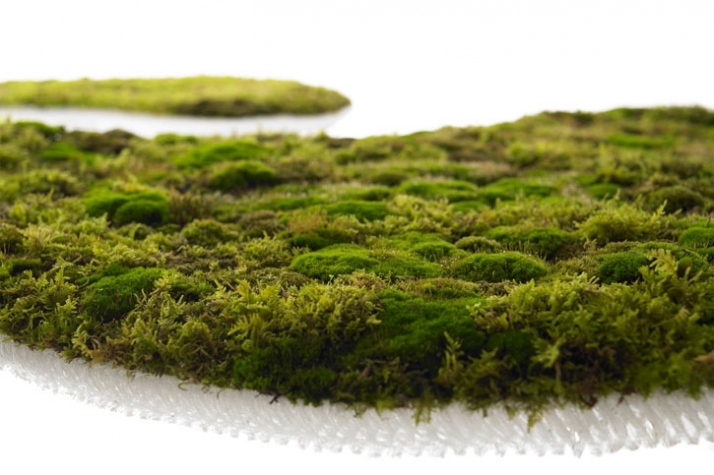 Moss grows by absorbing moisture from the air with its whole body, not just through its roots. Even if it dries out and looks dead, its cells can recuperate when given water. 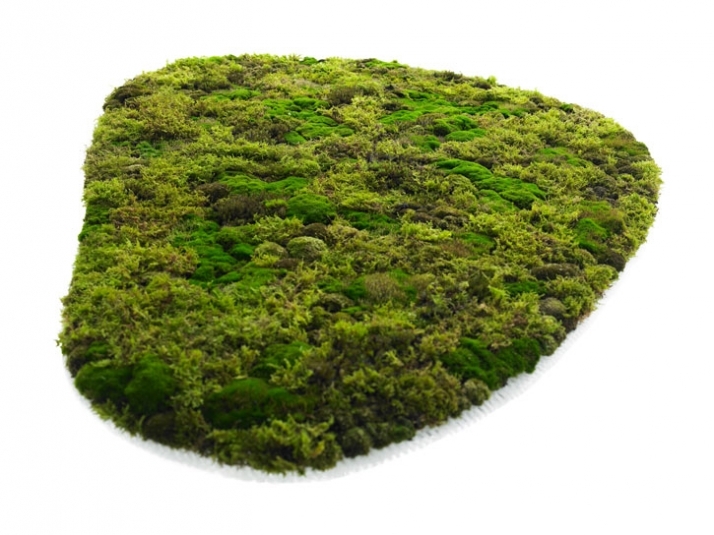 Moss is a green carpet that keeps on living, quietly keeping its place in the world. One of the characteristics of living things is that they spontaneously evolve continuing to be a part of nature. Unitika's TERRAMAC® is also the result of continuing evolution, with repeated improvements in fibers over time giving it its place in nature, just as if it were alive. Everything in this world is involved with other things around it, and viewing that involvement can trigger human emotions: We feel that something beautiful, ugly, wonderful, painful, fun, ephemeral, sad, and impressive or maybe we feel nothing at all. Each time our emotions are triggered surely represents a link to all the ongoing potential around us. My work for this exhibition shows the encounter and coexistence of two life forms with different origins. Living things connect strongly and straightforwardly, and conceal unlimited possibilities. Through this work, I hope that viewers will sense that they too are living beings. Time can be long or it can be short, but it is the only gift that is given equally to all living things. The time we spend together on the trail is always a one-off, and I hope that the coexistence embodied here will provide a reminder of that ongoing progress. Thanks to the NANO-TEX processing technique, this fabric has the ability to repel water and stains for an extremely long time. 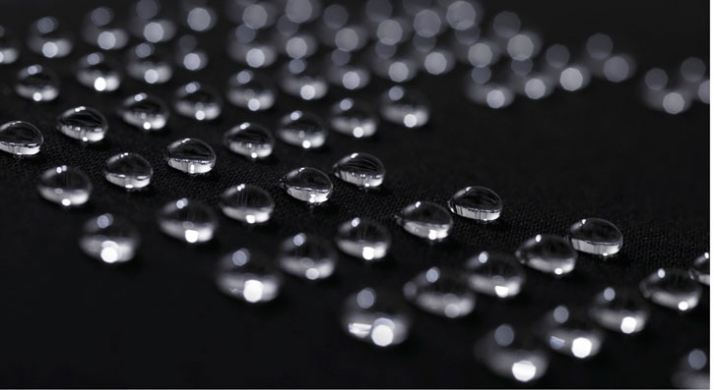 Previous water-repellent finishing involved coating the surface of the fabric. In the case of this revolutionary process, each individual fiber is treated with nano-scale water-repellent resin to ensure that the fabric remains breathable. Best of all, the fabric remains its original look and feel. 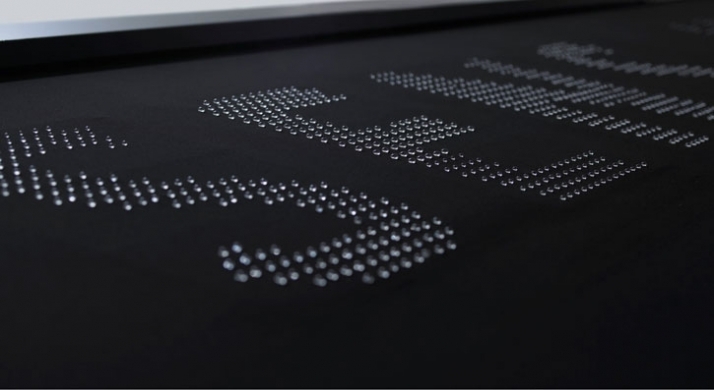 Drops of light create a sign on top of ultra water-repellent fabric. 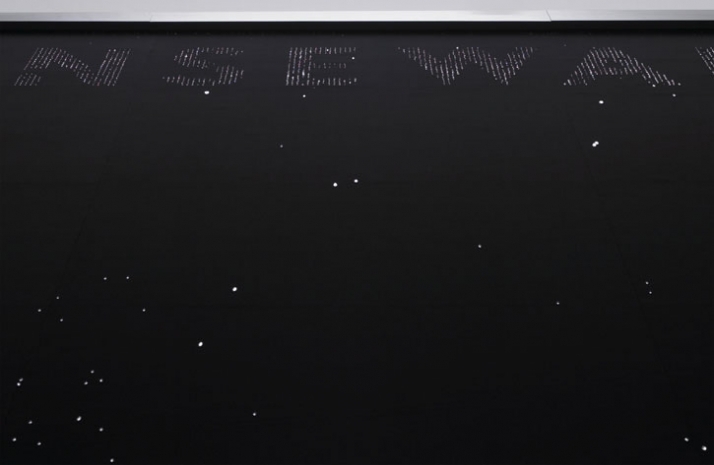 Driven by a hidden mechanism, water seeps through the fabric in groups of drops that spell out “Senseware”. The fabric slopes gently down to the front, so that whenever a drop reaches a certain size, it naturally begins to roll down the sloping surface under the influence of gravity. A new drop of water grows up to take the place of each drop that rolls away, so the water logo is constantly renewed. This is the ’09 version of the Water Logo fabricated for the Tokyo Fiber exhibition in 2007. 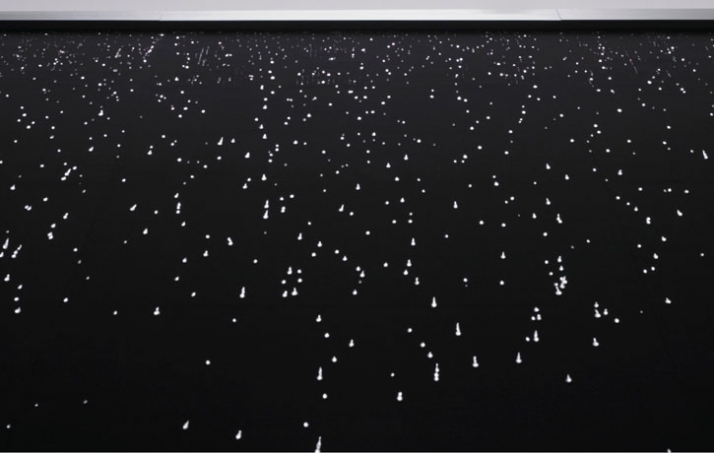 New in this version is a “reset” function, which occasionally creates a large number of water drops at the top edge, sending an impressive of water down the fabric. This shower of light sparkles like a diamond rain. When the shower has passed, not a single drop of water remains on the black fabric, but new drops soon begin to well up and catch the light again. And when they roll away, they have much further to go than in the ’07 logo, giving viewers a more satisfying visual experience.